BRIGHTON, Mich. - Sam Loria, a 76-year old man from Princeton, Texas was in for a surprise when he purchased his 2013 F-150 Platinum truck last week, as the truck is now just as impressive to Ford Motor Company as it is to its new owner. Ford has sold it's 33,000,000th F-Series pickup and Loria is its buyer. Having bought a Ford F-150 from the same dealership back in 1969, Loria admits this purchase was a little more impressive. Having owned 12 Ford vehicles in his life, he was shocked to discover that he now owned the 33,000,000th F-Series pickup truck that Ford has sold. 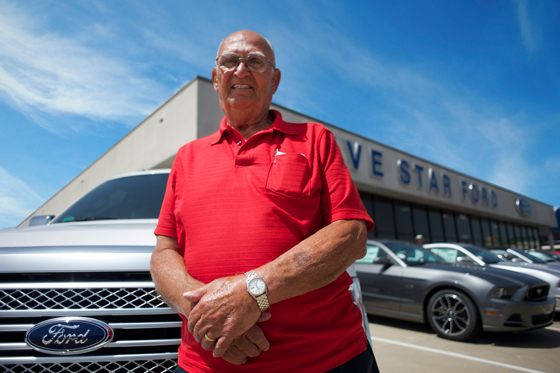 A longtime Ford customer, and a true Ford fan, he is pleased to own a little piece of Ford history. The Ford F-Series is the best-selling truck in America, and has been for the past 36 years. It is also the brand with the most trucks on the road with over 250,000 miles, and was recently chosen as the 'Best Light-Duty Pickup Truck' by PickupTrucks.com an Popular Mechanics Magazine. With these impressive stats, Ford can now add having sold 33 million of its trucks to the list. Looking to purchase your own best-selling Ford F-150? Check out the F-150s at our South Lyon Area Ford Dealer or see all of the specifics in our 2013 Ford F-150 Brochure. Brighton Ford is located at 8240 Grand River Ave. just north of I-96 in Brighton. We are a family owned and operated business that is committed to customer satisfaction. For more information on Brighton Ford visitBrightonFord.com or give us a call at (800) 836-8206.